Definition at line 9 of file MessageFile.h. Definition at line 12 of file MessageFile.cpp. Definition at line 17 of file MessageFile.cpp. References match(), messages(), myIsModified, myMatch, myMessages, myPostconditions, myPreconditions, myReplies, postconditions(), preconditions(), and replies(). Definition at line 27 of file MessageFile.cpp. Definition at line 31 of file MessageFile.cpp. Referenced by convert(), and setComment(). Definition at line 86 of file MessageFile.cpp. Referenced by convert(), CREMessagePanel::fillRuleItem(), setInclude(), CREMessagePanel::setItem(), and CRERulePanel::setMessageRule(). Definition at line 106 of file MessageFile.cpp. Definition at line 41 of file MessageFile.cpp. Referenced by convert(), CREMessagePanel::fillRuleItem(), MessageRule(), CREMessagePanel::onAddRule(), CREMessagePanel::onDuplicate(), CREMessagePanel::setItem(), setMatch(), and CRERulePanel::setMessageRule(). Definition at line 46 of file MessageFile.cpp. Definition at line 76 of file MessageFile.cpp. Referenced by convert(), CREMessagePanel::fillRuleItem(), MessageRule(), CREMessagePanel::setItem(), CRERulePanel::setMessageRule(), and setMessages(). Definition at line 66 of file MessageFile.cpp. Referenced by convert(), CREMessagePanel::currentItemChanged(), CREMessagePanel::fillRuleItem(), MessageRule(), CREMessagePanel::setItem(), CREQuestPanel::setItem(), CRERulePanel::setMessageRule(), and setPostconditions(). Definition at line 56 of file MessageFile.cpp. Referenced by convert(), CREMessagePanel::currentItemChanged(), CREMessagePanel::fillRuleItem(), MessageRule(), CREMessagePanel::setItem(), CREQuestPanel::setItem(), CRERulePanel::setMessageRule(), and setPreconditions(). Definition at line 96 of file MessageFile.cpp. Referenced by convert(), CREMessagePanel::fillRuleItem(), MessageRule(), CREMessagePanel::setItem(), CRERulePanel::setMessageRule(), and setReplies(). Definition at line 36 of file MessageFile.cpp. Definition at line 91 of file MessageFile.cpp. Referenced by CRERulePanel::onIncludeModified(), and MessageFile::parseFile(). Definition at line 51 of file MessageFile.cpp. Referenced by CRERulePanel::onMatchModified(), and MessageFile::parseFile(). Definition at line 81 of file MessageFile.cpp. Referenced by CRERulePanel::onMessageModified(), and MessageFile::parseFile(). Definition at line 111 of file MessageFile.cpp. Referenced by CREMessagePanel::onAddRule(), MessageFile::save(), MessageFile::setLocation(), and MessageFile::setPath(). Definition at line 71 of file MessageFile.cpp. Referenced by CRERulePanel::onPostModified(), and MessageFile::parseFile(). Definition at line 61 of file MessageFile.cpp. Referenced by CRERulePanel::onPreModified(), and MessageFile::parseFile(). Definition at line 101 of file MessageFile.cpp. Referenced by CRERulePanel::onRepliesModified(), and MessageFile::parseFile(). Definition at line 39 of file MessageFile.h. Referenced by comment(), and setComment(). Definition at line 44 of file MessageFile.h. Referenced by include(), and setInclude(). Definition at line 38 of file MessageFile.h. Referenced by isModified(), MessageFile::isModified(), MessageFile::MessageFile(), MessageRule(), MessageFile::save(), setModified(), and MessageFile::setModified(). Definition at line 40 of file MessageFile.h. Referenced by match(), MessageRule(), and setMatch(). Definition at line 43 of file MessageFile.h. 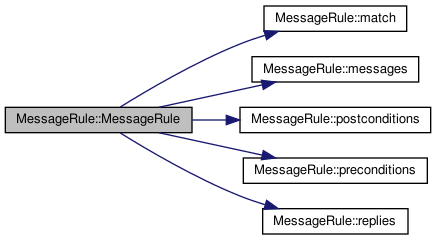 Referenced by MessageRule(), messages(), and setMessages(). Definition at line 42 of file MessageFile.h. Referenced by MessageRule(), postconditions(), and setPostconditions(). Definition at line 41 of file MessageFile.h. Referenced by MessageRule(), preconditions(), and setPreconditions(). Definition at line 45 of file MessageFile.h. Referenced by MessageRule(), replies(), and setReplies().